A brief note. In comments Tapen Singh, a pensions and finance expert, writes: “With the announcement of the QE3, the game is really over for Romney” and links to this graph. The effects of QE3 (Quantitative Easing 3, a stimulus program by the Federal Reserve) on the economy are likely to be felt fully on a time scale longer than the election, which is seven weeks away. 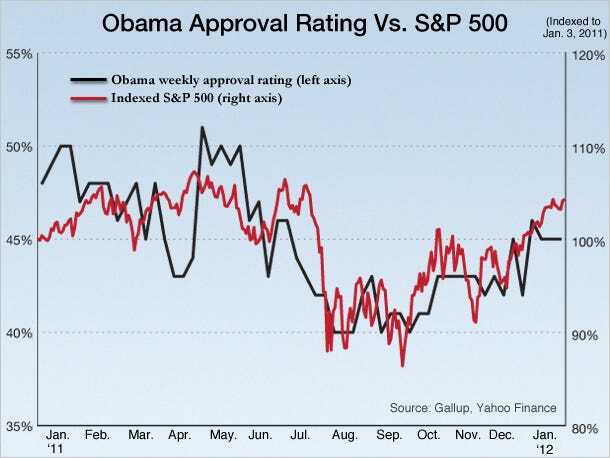 But presumably Tapen thinks the S&P will go up before then, and with it Obama’s approval rating. Is this really true? But what if it’s really like this? where S&P prices and Obama approval are downstream effects of other economic causes. In this case, S&P prices are a correlate, not a cause, and boosting stock prices mainly pleases the investor class. That includes only a minority of people, many of whom won’t become aware for many weeks that their investments have risen. However, the investor class does include Mitt Romney and many cable/television personalities. Maybe they’ll ease up on Obama. This is not an area where I add special value. But I am curious for reader reaction, since I know many of you are expert in this area. Update, 2:12pm: the effect of QE3 might be faster than I thought, as indicated by this simulation…though still longer than seven weeks. Here is a projection showing a remarkably fast rate of decreasing unemployment expected from the measures taken. If there was true correlation between the stock market and Obama’s approval, wouldn’t that graph show the market go up significantly before the approval ratings? After all, when we get poll numbers, they are usually at least a few days out of date and cover a period of about a week before that. And stock market numbers go up in response to expected future improvements, so they are forward looking while the approval numbers are backward looking. I’ve been looking forward to your measurement of the bump for Obama from the DNC convention, but have not seen it. Did I miss it? There should be some movement today when the FirstRead poll hits, the one showing an Obama lead in VA. Also, we are still waiting for fresh data for WI and NC. Finally, there’s a glitch in the OH data feed that we’ll fix soon. @Steve: I suspect the S&P 500 and Obama’s approval rating might well be a few days out of synch without that being readily visible, given the scale of this graph. We would need greater resolution. Olav, a cross-correlation would reveal which one came earlier on average. Good point. Not everyone in the investor class believe Willard & Paul will be “good for business”. After all, who is going to buy products if America’s consumer class is decimated? One problem though, is that Mr. Singh is not directly talking about the information in graphs such as this. He is talking about the future and from that vantage point both causal chains would be equally valid. You could rephrase and expand the meaning of his remarks thusly: The expectation that the QE3 will pour 85 billion dollars directly into the economy will cause a continuous Stock Market climb and Obama’s approval rating will correlate accordingly. If this occurs, Romney’s chance of winning will vanish. The continuance of the correlation is a much weaker conclusion than any putatative explanation of causality, and this milder conclusion is pretty convincing. And the actual causal explanation of investor “expectations” has plenty of solid and long term evidence going for it. As I recall, there’s been a lot of work on the correlation between consumer sentiment and incumbent approval ratings — strong correlation, not surprisingly. I also know that both the Fed and Wall Street economists (not surprisingly) have done a lot of research into the correlation between consumer sentiment and stock prices, and have concluded that rising equity values do indeed tend to give a strong boost to sentiment — not the other way around. Same thing for home prices. And it appears that housing values have stabilized, at least nationally, and are starting to rise. All that said, it’s interesting to note that Gallup has picked up a sharp spike in consumer confidence since mid-August. It’s still negative, of course, but higher nonetheless. Consumer spending has also spiked. It might just be that, despite the poor August job numbers (employment is a lagging indicator), the economic recovery is passing into one of its mini accelerations — just in time to push Obama over the top. Which means that for Romney, the old Wall Street adage might apply: Too late is too bad. a) In Europe, not a single leader in a crisis country has been re-elected since 2008.
b) For most of the 20th century, US stock price trends during election years have been an effective predictor of whether the incumbent would be re-elected (cf. Ken Fisher & Bespoke Investment Group). Up = reelection. c) Were it not for the Fed’s cumulative QE since 2008, USA equities would almost certainly be materially lower. d) Present economic conditions in USA are iffy at present, particularly in the labor market, which Fed Chairman Bernanke has expressed grave concern about in justifying open-ended stimulus out to mid-2015! e) The Fed is currently buying something like 70% of all new debt issued by the US Treasury. As most people know, the US has been running deficits of over $1 trillion per year since 2008. Without the Fed’s action here in printing enormous sums of money, it’s almost certain that interest rates would be significantly higher & the US would be facing an austerity crisis a la Greece or Spain. Adding these all up, I feel that Tapen Singh is correct in linking QE3 to the President’s reelection chances, given especially that US equities are typically said to discount (i.e. forecast) events about 6 months. But the above points suggest we can reasonably go further than Tapen, & suggest that President Obama’s chances of re-election might well be significantly lower without the extraordinary aggressive Fed action taken under Chairman Bernanke’s leadership. It’s interesting to note that “political stability” is cited so often as a critical goal in economic contexts. There’s an extremely interesting one-hour interview with Ray Dalio, one of the greatest investors of the present era, at Council on Foreign Relations (cfr.org), which touches briefly on this theme. Sir- What is known about the chances fr the marriage equality bill in Washington State this November? As one of many gay women married t a man because life is crazy, I’m vitally interested in seeing our nation become more sane. So I’d be interested in what you think about this issue nationwide. Does marriage equality tend to follow along with areas polling for Democratic candidates? Anything you have to say would be of interest.